You won’t see many recipes on my blog, despite the fact I’m a keen cook I find food styling quite stressful and it isn’t often I’ll share what we are eating. 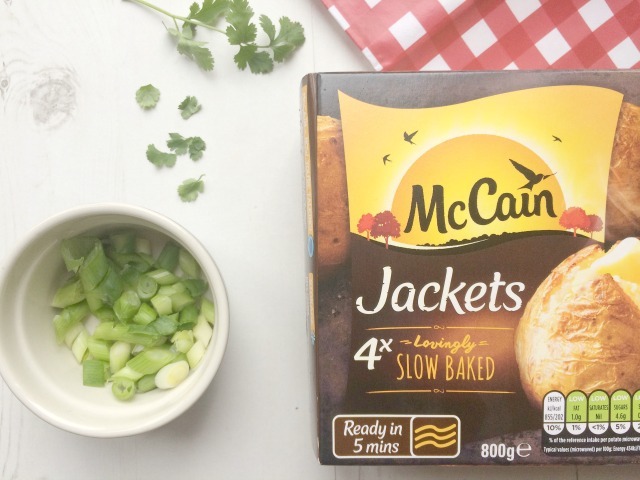 However, when McCain got in touch and asked me to create a topping for their frozen ready baked jacket potatoes I wanted to take on the challenge. I hadn’t actually tried McCain’s jacket potatoes before now. I’d spotted them plenty of times on the supermarket shelves and in all honesty I was a little cynical about how good they could actually be. 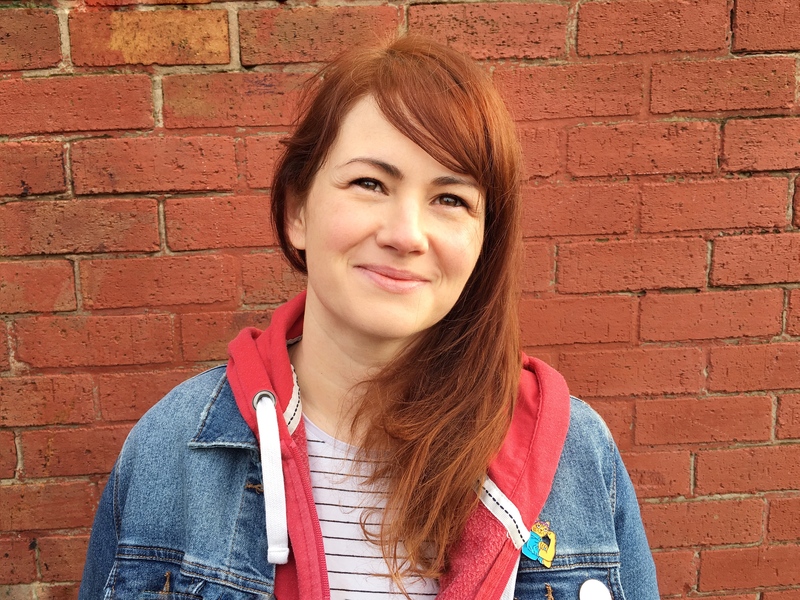 A frozen jacket potato?! Well, I have to admit that they have won me over – with McCain Ready Baked Jackets you get the crispy outside and fluffy inside that you’d usually get from oven cooking but you just pop them in the microwave and they are ready to go in five minutes! They are so much nicer than my usual baked potatoes done in the microwave. It’s been a revelation for me, my husband says I’m a frozen food snob but I’m starting to buy a lot of our vegetables and fruit frozen now. It makes such a massive difference to always have something in the freezer and to not have to worry about it going off. I hate wasting food and potatoes are always what I end up throwing away. 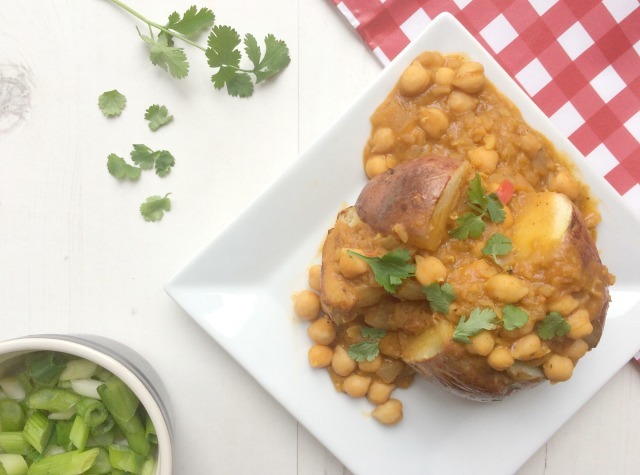 These frozen jackets are perfect for a quick, warm lunch for the twins and I love that they taste just like an oven baked potato without me having to cook them for an hour. For a tasty topping I had a think about what we usually eat with our jacket potatoes and often it is leftovers from another meal. It’s quick and easy for us as I just heat it up while the potato is cooking. If you’re short on time, McCain have some easy and delicious topping ideas over on their #LunchIn5 YouTube channel which can be prepared in just 5 mins – all whilst your McCain Ready Baked Jacket cooks in the microwave! This time though, I decided to go for a spicy lentil and chickpea dahl. I love dahl, you can put lots of good stuff in it and it’s proper comfort food. We aren’t totally vegetarian but we do eat mostly veggie meals as they are always packed full of good stuff. Lentils and chickpeas are so good for you as they are high in protein and fibre but low in salt and sugars. I always have them in my cupboard as they have a long shelf life and they’re so easy to add to our meals. I’ve kind of adapted my favourite curry recipe for this and added coconut milk which makes it creamy. It has a spicy kick which I love but leave out the red chili if you don’t like it too hot. I always find the dahl tastes better left for a day – I cook mine the night before I want to eat it. 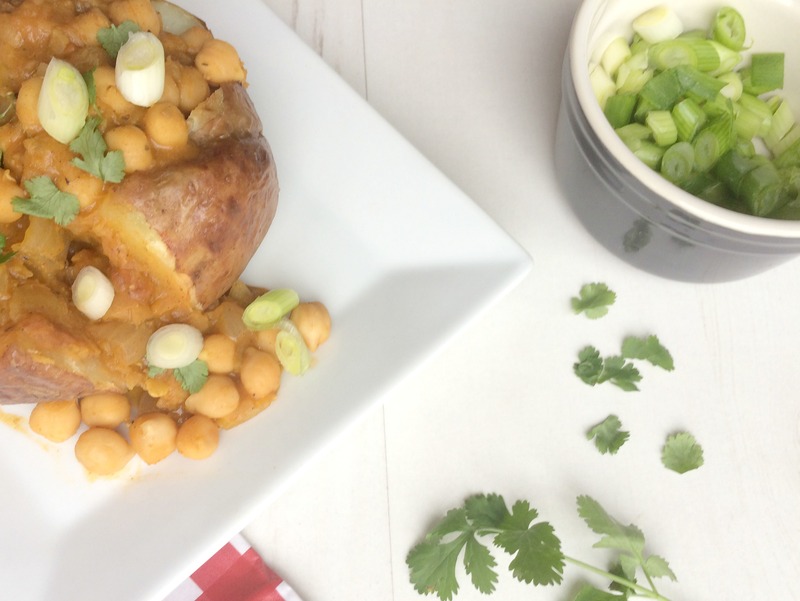 It can be kept in the fridge for a few days and freezes well, all ready to warm up and spoon over your jacket potato. This is lovely and warming while it’s still cold out and good for you too! Heat the oil in a large pan and add the onion, cook on a low heat for 10 minutes until softened. Add the garlic, chili, ginger, curry powder, tomato puree and tomatoes and cook on a medium heat for 2 minutes. Add the vegetable stock, red lentils and coconut milk. Bring to the boil, cover and simmer for 20 minutes stirring occasionally. Add the chickpeas and simmer uncovered for a further 10 minutes or until thickened. Cook the McCain Jackets as per the instructions on the packet. 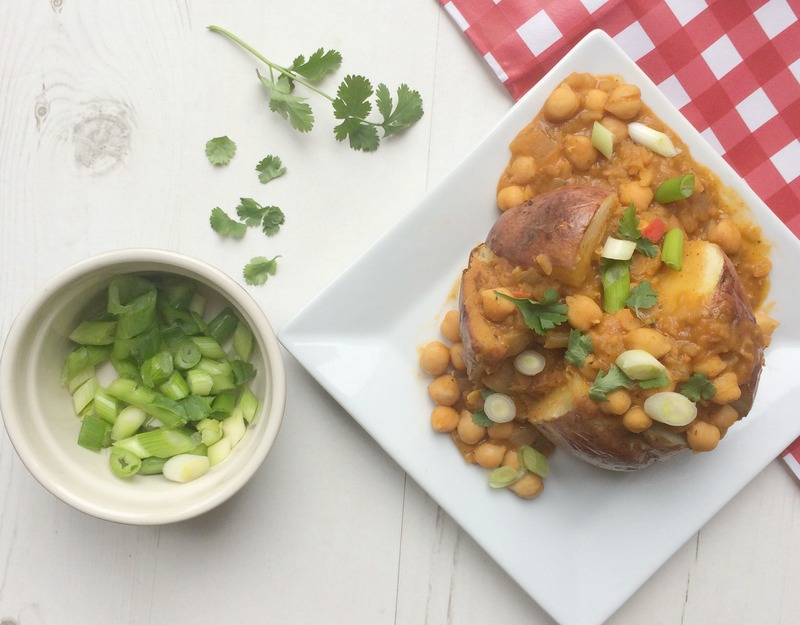 Season the dahl with salt and pepper and spoon onto the jacket potatoes, serve with coriander and spring onions. Post written in collaboration with McCain. 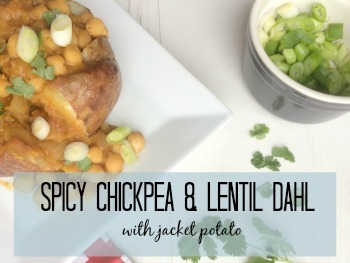 Ooh I would never think to put Dahl on top of a jacket potato but we always have some kind of leftover curry as my mum is forever packing us some. I keep seeing these jackets in the shop freezers but haven’t braved trying them yet! Honestly Tas, you should really give them a go! I’m converted and they are so handy to have in for a quick meal – especially if you have curry to go with them, perfect for a warm lunch! I love food like this, Hayley. Curry and comfort food is my heaven. My favourite ever meal is vegetarian chilli with a jacket potato. It’s divine! This sounds delicious. I’m rubbish at food styling. I think you’ve done a great job.